After the struggles with the fuel pipe on leaving Belgrade, it was a relief to be in such a peaceful welcoming spot as Radomir Lukovič’s campsite on the family farm near the tiny village of Radijeviči at the start of Uvac Canyon. We were surprised that Radko’s second language was Spanish, learned while working in Spanish-speaking Equitorial Guinea. Our Spanish is long forgotten, having been superceded by Italian, but we managed to understand his Spanish and he seemed to understand our Italian replies. 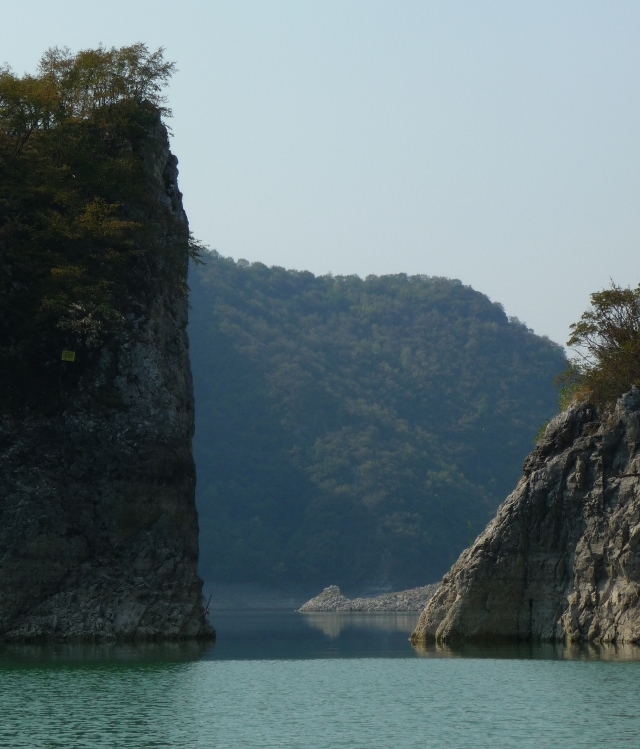 He arranges boat trips on Uvac canyon, an artificially flooded lake with a zigzag of bends. 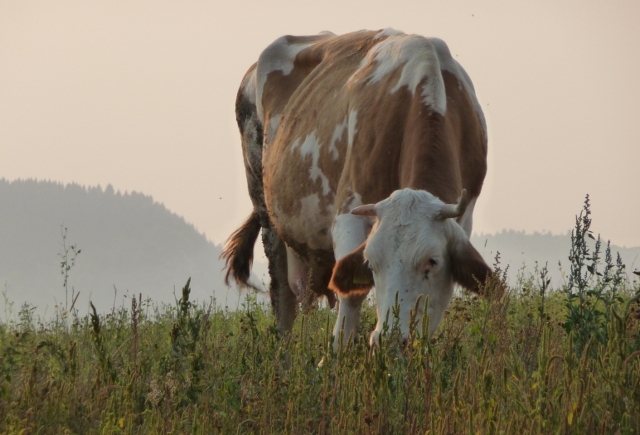 An early start and we were being lead down through pastures and woodland to the waters’ edge, then it was onto the little boat which chugged around the headland to pick up more passengers – three Serbian families. We saw Griffon vultures circling overhead. So many of them. Their population declined in this area to only nine pairs, in the early nineties, but has now increased to around 85 nesting couples again. A vulture restaurant feeding point was set up on a cliff top where dead animals and slaughter house waste was left and it was here that we could see so many birds wheeling around and descending for their breakfast, a bit more impressively than at the Hvar vulture sanctuary. Later we saw a vulture sitting on its nest on a cliff high above the water. As the boat meandered through a gap in the rocks and into the gorge proper, we dangled our feet in the water and fellow passengers shared food around. Our first stop was at a water spring, where everyone filled water bottles and containers. The track that lead from the water past the spring was part of the historic road from Dubrovnik to Istanbul, an ancient bridge lies submerged many metres below the surface of the flooded valley. This is a limestone karst landscape and we stopped to climb up to a cave. 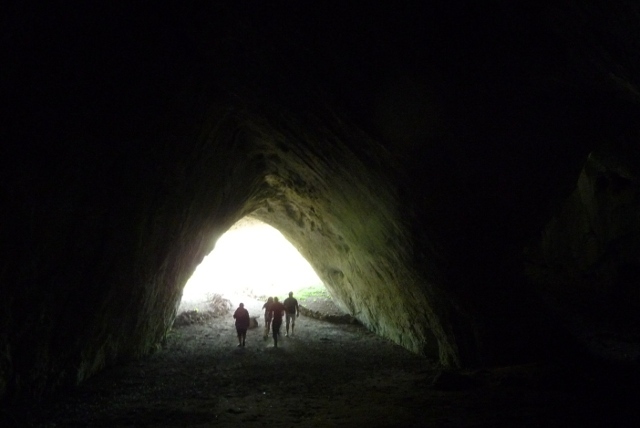 Not as big or impressive as some of the caves we’ve seen, but it felt like our own cave as I lead everyone along the path into the deep darkness with my torch and into the chamber of stalagtites and mites. 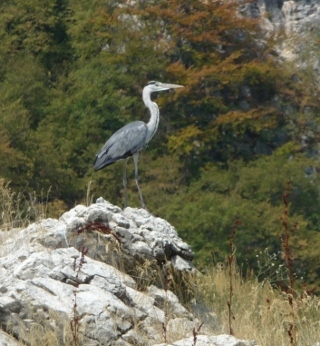 We had more amazing sightings of herons, eagles and more Griffon vultures as we zigzagged through the canyon. The best view of the zigzags is from above though, which we heard from others was a gruelling walk up and down in the heat of the day, our trip didn’t include it as there were lots of young children. Disappointed and relieved at the same time. After six hours on the boat, it was a relief to get back to the farmhouse. A huge mid-afternoon dinner awaited us. An array of dishes was laid out, all locally grown and homemade food. Roast goat, one of those from the herd we’d seen roaming the hillside, salads, roasted vegetables, soup, cornbread, probably the best burek ever (a bit like a savoury strudel) and Radko’s mother’s award-winning cheese. We washed it down with the obligatory sljivovica and some wonderful homemade berry juice. We didn’t do anything for the rest of the day, except relax in our tranquil orchard encampment. We were visited later by Ankica and Rade, who were staying in one of the cottages on the farm. They were from Belgrade and had some recommendations for a monastery we could visit, among other local sightseeing they had done. Overnight the weather changed. The temperature dropped sharply (nearly 20 degrees centigrade) and it rained. The start of autumn already? On our way out we found the delightful but locked wooden church in the village and drove via Prijepolje to Mileševa, the monastery Ankica and Rade had mentioned, which is famous for its 13th century icon depicting an angel dressed in white. 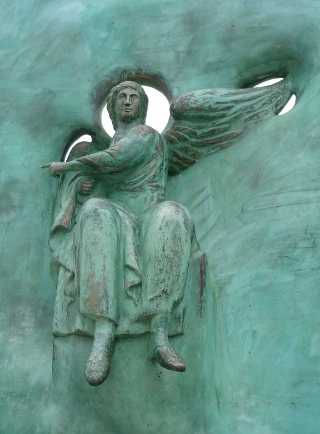 On the right is a detail from the striking modern sculpture depicting the white angel. It was a lovely place but looked better in their photos when the sun had been shining. We’d set ourselves another long drive across country, as we wanted to take in the Unesco listed monastery at Studenica. It turned out to be a very scenic route and the rain held off as we wound up and through mountains and valleys. 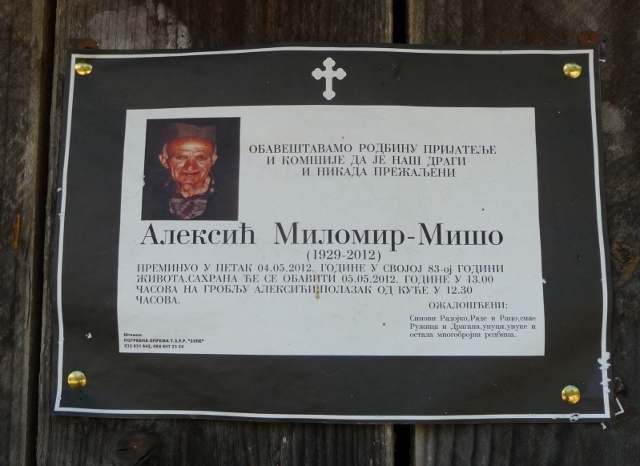 Ever since we were in Italy we’ve seen black edged death, funeral and in memoriam notices pinned up in towns and villages, on lamp posts, gates and notice boards all around southern and southeastern Europe. It’s a good way to let everyone in the community know, especially when you don’t always know everyone the deceased knew. We spotted this poignant example on the wall of a roadside barn. 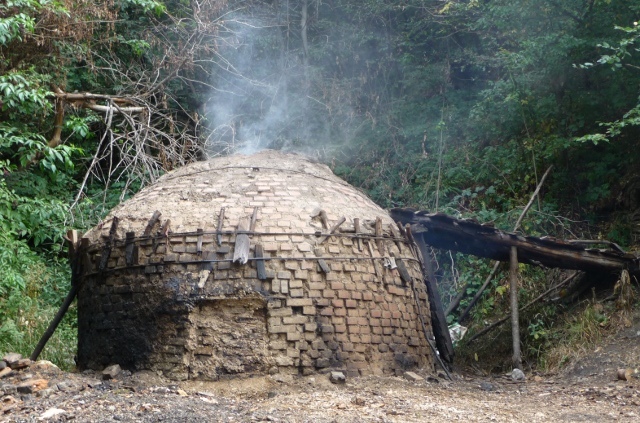 Occasionally we also came across small rounded brick shacks at the side of the road, smoking gently. Charcoal burning. This was the first time we had come across this activity and we saw and smelt several more burners on our way through. We reached Studenica and wandered through its ancient stone walls under the gate house tower and into its extended church. There was a Christening ceremony going on in its inner sanctum but we wandered around other chapels and the shop where we bought some wine. Once the Christening party had emerged for photos on the lawn, we were able to enter and see the wonderful frescoes and other works of art, some of which were undergoing restoration. As we drove out of the village a young woman stuck her thumb out. Kristina was one of the restorers from the monastery and was heading home to Kraljevo as the following day was a religious day and no work would be done. We were going through Kraljevo so in she hopped. She had worked for three months a year for five years on the frescos at Studenica and she reckoned on another 15 years for the work to be completed. We have really noticed and appreciated the role that restorers play at so many of the places we’ve been to on this trip. There was little between central Serbia and where we wanted to get to back on the Danuble east of Belgrade, and no campsites. So the long drive took us way into the evening. The weather was still iffy, but it rewarded with dramatic skies culminating in the brightest perfect rainbow arc we’d ever seen. 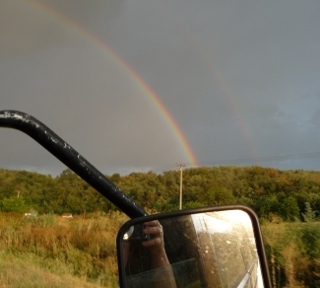 We even saw the rainbow’s end as it touched the grass verge of the carriage way – we almost got our shovel out to see if we could find the fabled pot of gold. But the rainbow’s end keeps moving and then it just disappears into thin air. We eventually got to Srebrno Jezero (an oxbow lake off the Danube) and Serbia’s ‘largest and oldest’ campsite. It took a lot of finding. Although we were able to get to the immediate vicinity there were no signs into the actual site which despite its size seemed to be very well hidden. Staff in a nearby motel helped a bit, and eventually we found it, just half an hour before reception closed at 8.30pm. As we were signing in the staff’s supper was brought over from a nearby eatery. It looked good, so as soon as we’d been shown seemingly the only free spot amongst a multitude of ancient caravans, random dogs and kittens, we made our way over there and ordered the same thing – stuffed plescavica (a sort of Balkan hamburger), and lots of chips. Washed down with a litre of house red and rounded off with a dunja – yet another rakija variety recommended by Kristina. This entry was posted in Art & Culture stuff, By Country - Serbia, Food stuff, Travel stuff, Wildlife stuff. Bookmark the permalink. Thank you for this post and the excellent photographs. This looks like an awesome trip! 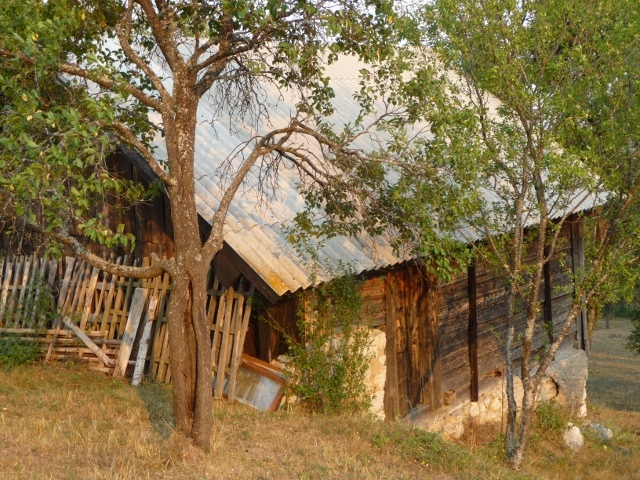 I’ve been looking into ‘off the beaten path’ tours especially in Serbia. Will definitely look up Uvac Canyon. Great pics as well.